Manchester City head to Wembley Stadium for their first chance at silverware for the season as they meet the Gunners in the Carabao Cup Final on Sunday afternoon. 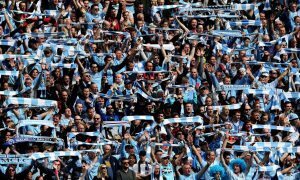 Following Monday’s defeat to League One Wigan in the FA Cup, City will be facing an Arsenal side that look rejuvenated through some new key signings. Will City be able to brush off their FA Cup woes and use it as motivation going into the game? After being heavily criticised for the lack of trophies in his maiden season in the Premier League, Pep has taken the Manchester City side to another level. This Sunday will be his first chance to make a mark on the historic performances the team have put in this season. While career statistics do not dictate the future, it is worth noting that Pep’s record in major cup finals is 6 wins out of 7 – only losing to Jose Mourinho’s Real Madrid side in the Copa Del Rey final of 2011. However, this is an important stat when considering the youthful City side that we are seeing this year. Pep’s experience, along with that of few senior players, will play a large role in making sure that the occasion doesn’t get to the more inexperienced players. The team’s average age is just over 24, and many of the first team players will be making their first appearance in a major final. So what do we need to look out for leading up to the final? It is safe to say that there should be no lack of motivation. This youthful side are hungrier than ever and want to bear the fruits of their success. One player to look out for should be the Portuguese maestro, Bernardo Silva. After a very slow start to his season at City (which can be forgiven due to our star-studded midfield) he has started to com into his own. Bernardo has been a regular name on the team sheet in the League Cup, and due to injuries, he has enjoyed his first run-out for the first team over recent weeks. Pep may look to reward his recent performances by placing him in the starting XI. Our focus should not be so much on that of our own team, but that of Arsenal’s. Over recent years, we’ve had mixed success against the side. That being said, it must be noted that results are improving against our North London counterparts. City have already run out winners against them this season – a convincing 3-0 win, which psychologically plays to our advantage. TEAM NEWS – STERLING SIDELINED? Fresh injury news was released in Pep’s press conference on Friday – Raheem Sterling is a cup final doubt due to sustaining a ‘muscle injury’ in the recent victory over FC Basel. This is an unwelcome injury as Sterling has been enjoying a sensational season, having already netted 20 goals while registering 6 assists in the same period. However, if Pep’s presser is to be believed, there will be the return of a familiar face. Forward Gabriel Jesus has been in training for a week now, and Pep has hinted that the Brazilian will be likely to feature in some facet during the final. This return will help alleviate the pressure on star-man Sergio Aguero, who has been carrying much of the goal scoring responsibilities on his shoulders for the past few weeks, as Pep acknowledged in his press conference. This pressure has been further relieved from the return of German winger Leroy Sané, who is yet another player experiencing career highs this season. A front 3 of Sané, Aguero and Bernardo Silva may me the most likely option to start the game with Jesus coming off the bench, but we know by now that Pep has a tendency to surprise everyone with his inclusions. One important question needs to be asked regarding City’s defence – Who will start for the final? While it is likely that Walker is nailed-on for right-back, we are now suffering a shortage at left-back due to Delph’s suspension on Monday. Who will start – Danilo or Zinchenko? We have seen a few performances from Danilo at left-back and one thing is for certain – he is a predominantly right-footed player, to put it lightly. While Zinchenko lacks the same level of experience as the ex-Real Madrid defender, I would say that a recognised left-back would be preferable to help stabilise the defence. As for in the middle, a cup final needs that stability – this would suggest a partnership of Kompany and Otamendi. While Stones and Laporte have exciting play styles which add a certain finesse, we will need confident and strong defenders to fight off the Arsenal attack. The only problem with this partnership is that it is lacking in pace, which could be exposed by the likes of Aubameyang to get in behind the defence. It comes as no surprise that Arsenal are enduring yet another tumultuous season, largely echoed by the persistent voice of unrest from the fans. However, they should never be underestimated. After fielding a weakened side in the Europa League, Arsenal lost on the night to Swedish side Ostersunds. While they never would have wanted to lose this game at home in front of their fans, this will not reflect the level of tenacity that they will surely bring for the Carabao Cup Final. The Gunners currently sit 6th in the Premier League table and are also out of the FA Cup. While taking nothing for granted in the Europa League, it could be said that this cup final is one of the only ways for them to salvage their season. Wenger may also hold a personal connection to the game, having never one this trophy – despite managing the team in two finals. Who poses a threat? While the departure of Alexis Sanchez is a clear blow, Arsenal have brought in very capable reinforcements in Pierre-Emmerick Aubameyang and Henrikh Mkhitaryan, though you can breathe a sigh of relief as Mkhitaryan is cup-tied and will play no part in the game. Aubameyang, however, is eligible to start and his blistering pace could prove to be a danger to our defence. The other obvious choice would be Mesut Özil. The German is often criticised for disappearing during games, but his skill on the ball cannot be ignored. On his day, Özil could create real problems for the defence, meaning that our central midfielders, namely Fernandinho, will likely be tasked with trying to keep him quiet. It must be said that, like Özil, we can never tell what kind of Arsenal side we will face. Will they be at their best or will City be able to control the game? Cup finals are in no way easy to predict, so I am going to assume that Arsenal are going to throw everything at us on the day. I believe we will see two teams fighting to control possession in the game, though resulting in less of an attacking edge and the reluctance of taking any early unnecessary risks in the game. I do think that it will be cagey at times, with City edging a 2-1 win, with Aguero and Fernandinho scoring the goals. Another prediction, though at this point it is almost a given, Belgian wonder Kevin De Bruyne will take the man of the match award following a stellar performance.